Scott Cook, owner of Fly and Field Shop , in Bend, Oregon recently gave a presentation to the Klamath Country Fly Casters, where he stated that great gains have been made at Crane Prairie Reservoir for the future of those famous Cranebows. The bass populations have leveled, and the average bass size has declined. One reason for this success has been the stocking of larger trout, which can escape the predatory jaws of bass. With the average size of rainbows reaching between 17 and 19-inches, stomach contents of both bass and trout show that the stickleback minnow has two predators now! So, keep this in mind as you read the following disaster story, which may indeed have a happy ending. Northwest Fly Fishing magazine has a feature article on Crane Prairie in their November/December 2008 edition. A pox on every fishing guide writer and publisher who keeps regurgitating the same old glorification of a famed fly fishing water that has devolved into an ecological disaster! A pox on every damned bucket biologist who denigrates or destroys a body of water for his own selfish fishing interest. Having departed from my usual objective, quasi-journalistic writing style, be prepared as, "I'm mad as hell, and I am not going to take it anymore!" Like most anglers, however, I am powerless. So too it would seem, short of using the poison, retenone, are the government agencies that control our waterways. This summer it has been particularly painful returning to Yellowstone Lake only to find that the lake trout have devastated the cutthroat fishery, or my sadness in returning to Rock Creek to witness the impact of Whirling Disease on one of my favorite creeks. And now, when I finally get to Crane Prairie, I am told, "You should have been here in the 70's or 80's or even the early 90's. Although some of the anglers I chatted with said that the lake was once again gradually improving, most said that they return to the lake to fish for larger, trophy size fish. Some of the anglers that I spoke with have been fishing the lake for years and are local residents. Most anglers now are bait fishermen who anchor their boats and fish the same spot for hours hoping to catch a solitary cruiser on power bait, worms, and dragon fly nymphs. Bass fishermen work the drowned timber stands, and trollers motor up and down the channels. What is missing is the large numbers of fly anglers who plied the lake. I realize that it would seem pretentious for me to write an article based on one weekend of exploring, and yet the sadness of this story compels me to vent. Perhaps I am in need of a catharsis after witnessing so many of these ecological disasters in a short span of time. However, Crane Prairie is not all "Doom and Gloom." The reservoir consistently produces huge trophy trout for anglers dedicated enough to learn its secrets. I spoke to two such men. One of the men spoke of spending five seasons on the lake before he could consistently catch trophy size trout. Another man claimed he was still a learner after seven years. Although most of the local guides have shifted to more productive waters to satisfy their clients need to catch numbers rather than trophies, a few guides have remained on the lake. I have included the name of one guide that I met and chatted with briefly. I include his contact information at the end of this article only because I ran into a couple who have hired him a couple of times and just gushed with praise for the man's skills and knowledge. Let's start with an excerpt from the web site of Oregon's Department of Fish and Wildlife. "Home of the famous "cranebows", Crane Prairie Reservoir is one of the top producing rainbow trout fisheries in Central Oregon. Rainbow trout here average 2 inches of growth a month during the summer. The record rainbow to date weighed over 19 pounds, with abundant rainbows in the 4 to 10 pound range. Crane Prairie Reservoir is a Wildlife Management Area. Osprey, bald eagle and many waterfowl frequent the area. Crane Prairie Reservoir is located on the Deschutes National Forest and is a large, shallow impoundment on the upper Deschutes River approximately 30 miles southwest of Bend and is accessible from Century Drive (Forest Service Road 46), and Forest Roads 40, 42, and 4270. Crane Prairie was a natural meadow in which the Deschutes River, Cultus River, Cold Creek, Quinn River, Deer Creek, and Cultus Creek Converged. Crane Prairie Reservoir was first created in 1922 by rock filled dam and reconstructed by Bureau of Reclamation in 1940. The inundated trees and five square miles of shallow water coupled with cool water inlets make Crane Prairie Reservoir a very rich and productive aquatic system producing numerous trophy size rainbow trout. Oregon Department of Fish and Wildlife currently manages rainbow trout at Crane Prairie Reservoir for natural and hatchery production consistent with the Featured Species Fish Management Alternative for trout. Mountain Whitefish, brook trout, and kokanee are managed for natural and hatchery production consistent with the Basic Yield Management Alternative for trout. Largemouth bass shall be managed for natural production consistent with the Basic Yield Management Alternative for warm water fish." Now, here are the facts never mentioned in fishing guide books or blurbs on promotional tourism sites. In the mid 80's some bucket biologist dumped largemouth bass into Crane Prairie. Although Crane Prairie has wild and sustaining populations of rainbows and Brook Trout, the bulk of the fish caught are planters. Once the alarm cry was sounded about the growing bass population, they were already big, bold and hungry! The 3-4 inch trout plants became bass chow. The Oregon biologists steadfastly proclaimed that few of the transplanted trout were preyed upon by the bass. Wishful thinkers theorized that the two populations would tend to gravitate to their own preferred waters. The bass population flourished, and Crane Prairie established itself as one of Oregon's premier bass lakes. Fly anglers gradually declined from their proportionately high numbers. To add insult to injury, bucket biologists struck again introducing the Three-spined stickleback minnow, which many anglers that I spoke to feel are responsible for the crash of the damsel flies and dragon flies on the lake. Here is an excerpt from an ODFW report found on-line. "Three-spined stickleback have been present in Crane Prairie Reservoir since the early 1990s. This species was an illegal introduction and likely released to provide forage for warm water species in the reservoir which were also illegal releases. Schistocephalus is a common parasite in stickleback. High productivity of the reservoir and conditions favorable for completing the tapeworm life history contribute to a high incidence of occurrence of the tapeworm in stickleback. Fish samples collected in 2000 and 2001 were provided to ODFW pathologists for analysis. No incidence of Schistocephalus infection was found in fish species other than stickleback. Schistocephalus were found in digestive tracts of trout along with three-spined stickleback parts indicating that trout had ingested stickleback with parasite infestations. Largemouth bass diet studies have also shown secondary ingestion of Schistocephalus resulting from consumption of stickleback. [Now, note this disclaimer.] There is currently no evidence linking Schistocephalus occurrence to the decline of rainbow trout in Crane Prairie Reservoir." To butcher an old folk song, "Where have all the rainbows gone, long time passing...." One government report stated that the illegal bass introduction "disturbed" the trout populations. Disturbed - what an interesting word choice for a biologist to use. It almost sounds, well, scientific! What has been reported is a declining population of young bass and trout. Terry Schrader from ODFW states that, "the stickleback [illegally dumped into the lake to provide forage for bass] out competes the young of these species and has also changed the dominant form of zooplankter." This in turn has produced high levels of toxic cyanobacteria that is potentially fatal to pets and young children. Another factor, similar to what happened in Diamond Lake with the illegal introduction of chubs, is the increased likelihood of algal blooms. So, Mr. Bucket Biologist, what a fine mess you have got us into. And now the good news. Bass populations are in decline both in size and in numbers. (I can not substantiate this statement, but it was a consensus.) During the last two years ODFW has been planting trout from 8 to 9 inches. These larger size plants have a greater life expectancy in escaping the jaws of large trout and bass. I fished one entire day for bass in the north end of the lake by the resort. I caught one bass. The second day I explored the southern end of the lake and finally was able to locate some fly fishermen to interview. Since I have no experience in catching bass on the lake (yet), I have compiled the following information for first time anglers and campers to the lake. It would seem prudent for anyone planning to stillwater fly fish Crane Prairie to go out with a guide. As I mentioned earlier in the article, I did meet one guide who was both friendly and helpful. The next day I spoke to a couple who were heading out on the lake in a drift boat. They spoke glowingly of the same guide, Brett Dennis. He may be contacted at 541-598-0008. Camping: For RV camping with full hook-ups, contact Crane Prairie Resort at PO Box 1171, Bend, Oregon 97709. (541) 383-3939. 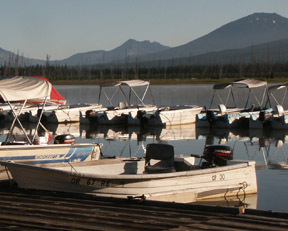 Located 33 miles from Bend and 20 miles from Sunriver, the resort offers full RV Hookups, boat rentals, tackle, gas, moorage, groceries, guide service and showers and laundry. It is right next to the Forest Service Crane Prairie Campground. Crane Prairie Campground: Offering 146 sites and a boat launch at the northern end of the lake, the campground offers trailer and RV camping and a special designated tent camping section right on the lake. The roads are paved and two boat launches are provided. Users will need to pay a $5 use fee for launching their boats if they are not camped. Premium sites cost $12 per night. (2007) Showers may be paid for at the adjoining resort. Trout Fishing: I can't proffer any advise on fishing tactics other than what I have learned from chatting with fellow anglers over a two day period. Here is what I learned. Because the lake averages nine to eleven feet water depth, trout tend to seek sanctuary in the old river channels when water temperatures climb. At the southern end of the lake, five river channels cross the broad body of water. In the spring and fall the trout tend to disperse into cooler water. With declining numbers of fish, target the channels exclusively during the summer months. Seasoned anglers map holes and springs with GPS. The channels are easy to locate if you have a fish finder that displays depth. On my last day my step-son joined us. As we cruised around looking at the channels and marking fish, I told him of a strategy I learned from bass anglers. If you are fishing a lake arm with a river channel, use a series of buoy markers to mark the channel. I pulled one out that I had bought from Cabela's. Simply drop the weighted marking buoy overboard. When the weight hits the bottom, the buoy stops unwinding, and you can turn the boat around and anchor. Twenty minutes later I saw the splay of fly line shimmering in the skyline from an anchored boat. When I glassed the boat, I spied a familiar fluorescent orange marker buoy. Most fly fishers use large strike indicators with chironomid nymphs. Other successful patterns are dragonfly nymphs, leech patterns and Woolly Buggers. An excellent resource is Scott Richmond's book, Crane Prairie - Deschutes Headwaters, published by Frank Amato. 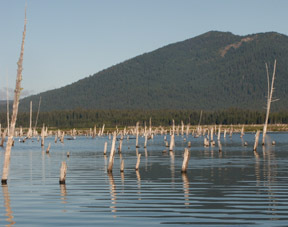 Bass Fishing: Although I spotted a few bass fishermen in the Cultus Channel, the majority of bass anglers worked the drowned trees on the west side of the lake above and below the Quinn Channel. This page contains a single entry by David Archer published on November 2, 2008 8:58 PM. Fishing in the Sky Lakes Wilderness / Highway 140 was the previous entry in this blog.